Let’s talk about insulation for metal buildings. Cooling and energy costs are certainly cause for concern in this part of the country, where we have a lot of direct sunlight and triple-digit temperatures — insulation for metal buildings is important for many homes and businesses. 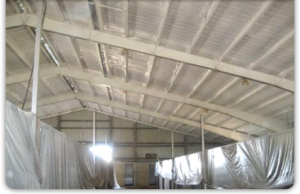 You might think that extreme heat and sun would ruin the appeal of metal structures, but proper insulation for metal buildings can help control the energy expense and allow you to take advantage of the many positives they offer. There are a lot of good reasons to consider purchasing a metal building — but there’s also one really important drawback to consider before you make your final decision. 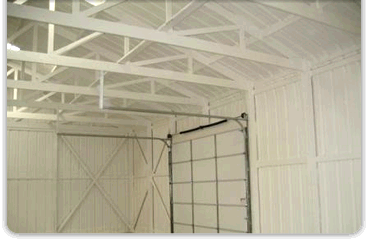 Basically, metal buildings are great for type of storage or activity that must be temperature-controlled. Metal buildings have many possible uses for people with a variety of lifestyles, careers, interests, and hobbies. All of that durability adds up to reduced insurance costs and low maintenance expenses compared to a wood structure. There’s even more savings in a metal building than just insurance or repair costs. Metal buildings assemble quickly and require a lighter foundation slab than buildings made from other materials, which means further savings at the time of construction. Additional money can be saved by using pre-engineered kits to cut down on wasted building materials. All of that savings sure looks like a serious thumbs up for metal buildings, but there’s an obvious disadvantage that also has to be considered — temperature control. 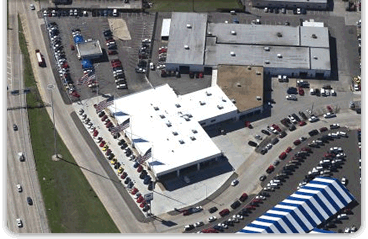 At DFW Urethane, we’re not here to sell you a metal building. We believe that is entirely possible, but that means insulation — for metal buildings it’s critical. To accomplish that, we recommend our spray polyurethane foam (SPF) insulation — for metal buildings, it’s the most effective insulation on the market. SPF insulation provides an airtight seal for consistent, year-round temperature control by forming a chemical and physical bond with the building’s structural materials. It’s applied as a liquid, and then it expands to fill seams and cracks — it also encases the metal braces and joints of your building as it expands. For most metal buildings under normal conditions, we recommend spray foam insulation on all 4 walls and the ceiling, which results in an airtight seal that keeps heat out and the cool, conditioned air (that costs money) in. Thanks to this airtight insulation for metal buildings, your air conditioner doesn’t need to work as hard to maintain constant temperatures. All that means greater comfort at a substantially lower energy cost. Sometimes, we are asked to give an estimate on retrofitting an older metal building, and we find a leaking roof. SPF is still a great option that can both solve the leak problem and provide necessary insulation at the same time. 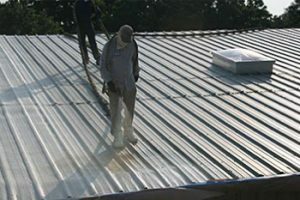 For example, we may start with 2-3” of SPF sprayed on the roof and then coat it with either the GE Enduris Roof Coating System or the Everest EC/HT Acrylic elastomeric roof coating (both come with long-term warranties), which should repair the leaks and provide the “lid” to the insulated structure. Then, we would cover the other four walls with a spray foam insulation, like our 2 lb. closed-cell SPF, to complete the airtight-and-waterproof envelope. One more thing — if you’re worried about troublesome installation or how foam-sprayed walls will look, it takes about 15 minutes for the foam to set, and then it can be covered with sheet rock or panels, which are easy to paint or decorate to your liking. You’ll be back to work in no time with something that will look appealing. 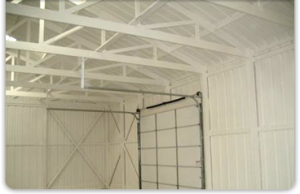 There are so many benefits to commercial metal buildings, and they have so many uses. But, to get all those advantages without the drawback of high cooling costs, insulation is critical. 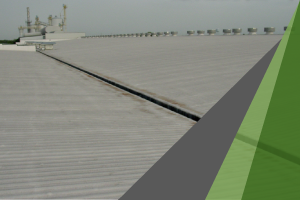 You can find more information about the many benefits of SPF insulation for metal buildings (and temperature control) by clicking the button below. I love how you said that you can use steel buildings for storage or other activities. My hobby is working on cars and other kinds of metal but I don’t have anywhere to store my work right now. If I start to turn a profit I’ll have to look into buying a building like this to store all of my stuff.